Hello! Welcome to my Booth! First, let me appolegise for the missing pictures. I am working to clean up those pesky blackouts. Please bear with me! I hope to be back to normal soon! Always happy to see you! Please look around and let me know if you have any questions! I have lots of pretties for YOU, your HOME, and your GIFTING! Always family friendly! P.S. Please bookmark or FAV me so you can return to do your everyday and Holiday shopping! GLITTER4YOU doesn't have any items in their booth! GLITTER4YOU is one of the best sellers if not the best seller I have ever met. She is conscientious, honest, and a wonderful person. I highly endorse this wonderful lady. What a lovely Seller, fun helpful and a true asset to Bonanza, buy with confidence from GLITTER4YOU!! Absolutely splendid member of the community! 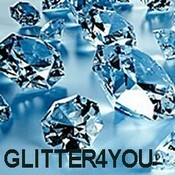 Very proud to have had GLITTER4YOU as a buyer. Simply the best! A wonderful seller who has the best customer service with a personal touch. Buy with confidence from this great seller and lovely person. Glitter works on a selfless work ethic making others look good as opposed to me who works on a selfish work ethic just ask me LMAO ..thanks Glitter for all your help and inspiration ! This wonderful seller is also a wonderful buyer. Could not ask for a better bonanzler. Sweet nature and top notch personality. Glad to have met ya Margaret! FUN seller with BEAUTIFUL treasures to be found in her booth! Gorgeous glitter plus a whole lot more! Very sweet seller, happy to call her a friend, complimentary, kind to other sellers. Great to deal with a pure pleasure for sure.